Help Desk Phone Number: (979) 484-7114 Call or text for assistance at the event. Personal Attendants for mobility, shopping, and eating assistance. 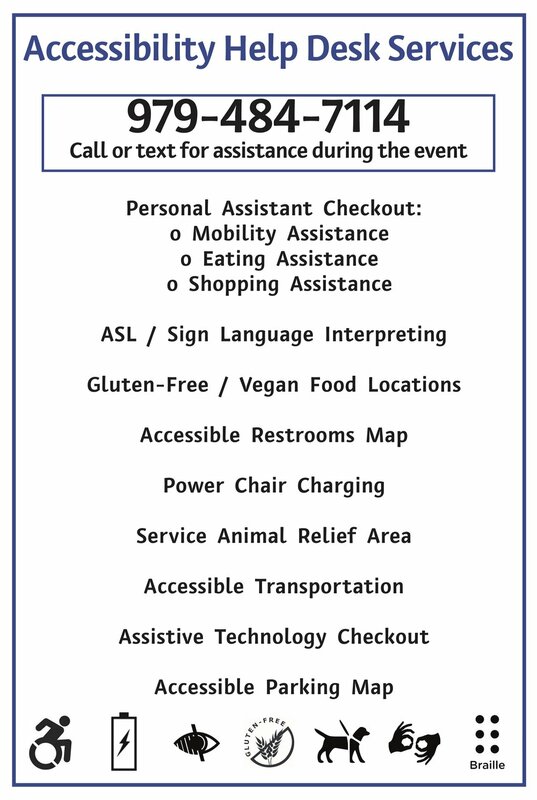 The BVCIL tries to meet all needs of guests to the festival that may have a life-long disability, a short-term disability, or a reaction to the weather and/or their surroundings at the event (i.e., weakness/fatigue, lowering stress due to surroundings, on-site injury that is not an emergency, etc.). Our goal is to provide equal access for all guests to enjoy the festival to the fullest capacity. The BVCIL is happy to serve our community as a service sponsor and an advocate at this event. The BVCIL is a consumer-based, consumer-controlled, cross-disability, cross-cultural, non-residential, private nonprofit 501(c)(3) corporation. BVCIL’s mission is to promote the full inclusion and participation of individuals with disabilities in all aspects of community life!